A nickel and graphite based anti-seize compound formulated to protect up to 2400ºF against seizure and galling, galvanic and severe environmental corrosion. 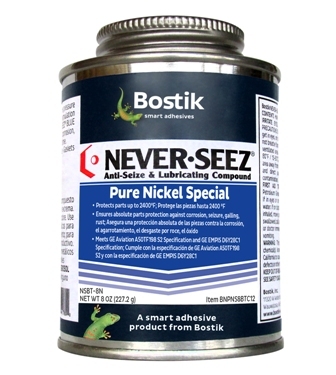 Never-Seez® Pure Nickel Special is a superior, high temperature anti-seize and extreme pressure lubricant. It contains flake particles of pure nickel, graphite and other additives in a special grease carrier found to enhance anti-seize performance. This product is recommended for use when applications prohibit the presence of copper, especially when resistance to corrosive acidic and caustic solutions is required. Meets Boeing BAC 5008, Ford ESE-M12A4-A, Garrett Engine Div. PCS5721, GE Aircraft A50TF198 Class A, General Motors 14001899, Pratt & Whitney PWA 36053-1 and is tested to MIL-A-907.